Customize your certificates with 7 Professional and Fun Certificate Template Designs in 13 Popular Certificate Award Categories. 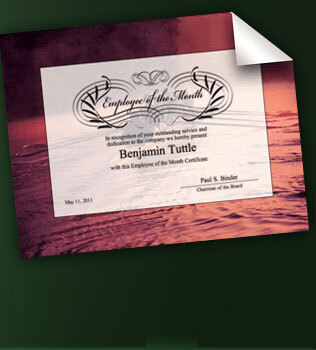 Present your certificates with professional personalization. Download FREE Templates for your Successories Certificates. Easily personalized and customized using Microsoft Word to fit your needs. Mac and PC compatable. If you are using Word 2007, you'll need to open your downloaded template and save as "Word Document" and then restart Word before printing.